"On Saturday, Oct. 25, Deo Cantamus presents Abraham, a new oratorio by University of Minnesota Ph.D. student Josh Bauder. Only 27 years old, Bauder already has numerous credits as a composer with the organization." "[M]oviemakers have mapped a secular destiny for America that doesn't bode well for its citizens." Read more about "[M]oviemakers have mapped a secular destiny for America that doesn't bode well for its citizens." Posted with permission from Sunesis. Art brings philosophy down to earth. While this writer is not artistic, he does understand to a limited extent the philosophy of art. Modern artists believe in several concepts. First, modern artists believe in the uniqueness of the artist. The artist is the creator. Because of the emphasis on the individual, the modern artists are highly trained and elitist; there are only a small number of true artists. Second, modern artists believe in the integrity of the art itself. The product of the artist is singular, a unique product different from all other art works. Modern art is absolutist—pure form and disembodied beauty. Art exists for the sake of the product. Third, the art of the modern artist is a vision of truth. There is some connection between the art and the world around us. It may not look like truth to the viewer, but the artist himself had some intention of linking his art to the world. Because artists tend to be countercultural, not every current artist is postmodern in his or her philosophy. Some artists today have reacted against modern art by using past styles and going back to human values, but postmodern art is distinctively different. First, postmodernism plays with art. There is no longer a distinction between what is artistic and what is not. Second, postmodern art is not individual. The postmodern artist is not concerned about himself, but focuses on the viewers’ reactions. Third, postmodern art rejects any concept of truthfulness. It makes no necessary connection to reality. It seeks for disunity. There is no truth; everything is fiction. Since postmodernism rejects any moral absolutes, art becomes political, not moral or philosophical. 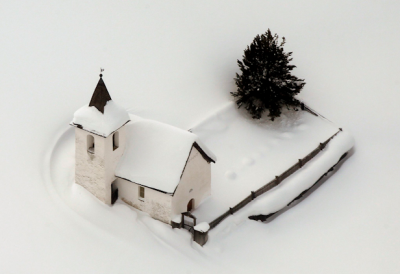 A church stood in the snow-covered village of Jenisberg, near Davos, Switzerland, Jan. 23.